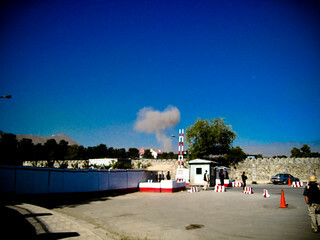 Just moments after a car bomb targeting the Indian Embassy in Kabul exploded. We were off base at the time walking to where we teach. I turned around, took a quick picture and then we high-tailed it back to base where we were on lock-down for the rest of the day. I know the colors are whacked out here but I had to do a reverse negative effect to get the cloud from the explosion to stand out.